Budgie as a weapon? Sure, why not. Danny Stafford was an ordinary kid until his brother shot him in the face. It was an accident that changed Danny, but it isn’t until his 30s that the change fully takes hold. Now in a stable relationship, renovating a house, and working a dead-end job, Danny’s life is turned upside down. And that’s before the Hoodoo Man starts coming for him. Back in my formative years, the local librarian introduced me to the adult section of the library after I’d read everything on offer for young adults and kids. This novel, The Hoodoo Man, was the first she pulled off of the shelf for me to try. A brand new horror novel by a UK author. Bit of a leap. But I was hooked. I clearly remember devouring this book, to the point that I missed at least one meal. This is where this story becomes interesting. 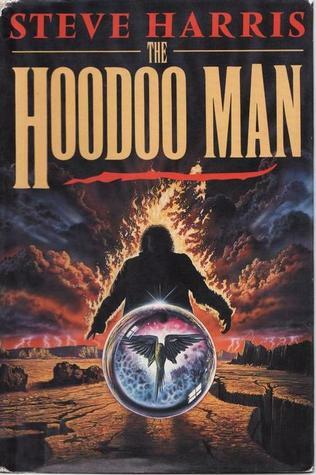 The Hoodoo Man was Steve’s third novel and it was his most successful, it put him on the map, and became his website’s name. But his career was all but over by the time his seventh novel was released and he retired at the end of the 90s. His career came to an end after his publisher was bought out and he was dumped. He had one completed novel he was shopping around, another in the works, and a third that had originally been intended as his sixth novel but was deemed too terrifying*. Harris’ novels went out of print and after no success in finding a new publisher, he retired from writing and ran to the hills**. In this day and age, a writer in this situation would probably take their back-catalog and self-publish, then release their new material. Of course, a publisher would be unlikely to let an author go out of print. But it does make me wonder how many authors are in a sense lost to us because of the machinations of the publishing world. I guess they won’t be getting any money from me*** hunting down Harris’ back-catalog in the secondhand stores. *The Switch was an attempt by Steve to bring the reader as close to feeling actual pain as possible. Back when his website was active I read an excerpt and can confirm that he succeeded. I have never looked at liver the same since. **This bad reference to Iron Maiden’s bass player of the same name brought to you by the number 666. ***Obviously, Steve won’t be either.